The uninstructed class. These know next to nothing of what the Word of God says about this subject, though they may have felt something of the exercises that lead to it. The enlightened class. These could possibly explain, in a very orthodox way, the terms of this deliverance, and are yet in such a sleepy, self-satisfied moral state that they are quite content with knowing the letter of it, while thoroughly destitute of its power. It is one thing to be told, by those who have experimentally learnt it, that by throwing your head back, keeping your hands beneath the surface, and lying quietly on your back in the water, your body will float, and quite another thing to find yourself, in ten fathoms deep, putting it into practice. We may think we know all about it as we stand on the bank. But in the water, we must either trust its buoyancy, lie still, and float; or, for want of confidence, vainly struggle, and sink. The consciously needy class; and how great their number! Some of these have, perhaps, for long years been in perplexity. How often have they struggled and sunk, to use our figure. They have buffeted with grave difficulties as to their personal state before God, until they have become a daily puzzle even to themselves; and earnestly — oh, how earnestly! — do they long to see their way out of it. that, with true desires to do the right thing, he constantly finds himself doing the wrong, and often does the worst when he means the best. he is helpless in what he feels he ought to do—a slave of sin. but the lion is the same lion still, adorn him as you will. This will serve to illustrate our present subject. The young Egyptian had before his mind two masters, the old and the new. The old master's service would have landed him in death but for the timely interference of the new. He owed his life to the new master, and nothing but death to the old. To which, then, should he now yield himself to serve and obey? Yield to his old master? Never! The question was as quickly settled as it was proposed. Grace, kindness, and power were all on the side of the new master, and to his service he would gladly and instantly yield himself. In doing so, next to death itself, his greatest fear was being given up again into the power and service of the old, though both his fears were groundless. Another word as to this “yielding.” There are many true, earnest souls today who are seeking what is called a “higher life.” No doubt what they are really seeking is the deliverance we have been speaking of, but they hope to reach it by an act of entire consecration, thus beginning altogether at the wrong end. But look at Rom. 6:13 again. We are here exhorted to yield ourselves to God as those that are alive from the dead. In other words, we do not yield to get this blessing, but because, through grace, it is ours already. We hold ourselves to be such. On the other hand, we cannot have peace and joy by the Holy Spirit in our souls unless there is unreserved surrender to the Lord. It is thus that we prove “what is that good, and acceptable, and perfect, will of God,” Rom.12:2. Liberty to look away from self for everything, knowing that all God could wish for in a man He finds in Christ, and that “as He is, so are we in this world,” 1 John 4:17; John 14:20. Liberty to regard myself as entirely connected with the renewed nature, the old “I” no longer, but Christ my life, and the Holy Spirit the power of occupying my heart with Christ, in whom is all my expectation. Liberty to regard God no longer as a judge taking notice of what I am in myself, but as having put me in Christ's place as a son, so that by the spirit of adoption I cry, “Abba, Father;” and as finding His delight and joy in blessing me, and making me happy. Liberty to know that if the Son has made me free, I am free indeed; John 8:32-36. Liberty to look at the glory shining in the face of the Lord Jesus, and to be at home in that blessed place of holiness and love. Liberty to remember that every blessing comes to me through and in Christ in such unmerited grace that I need never henceforth search my own heart for a single reason why He should or should not bless me, either here or hereafter. Liberty to serve, in the constraint of loving gratitude, the blessed Deliverer Himself, and His beloved saints for His sake, until the return of His Son from heaven. 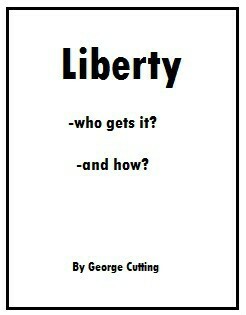 This is liberty indeed, dear reader. Is it yours?